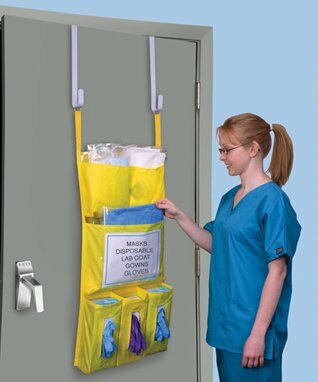 Health Care Logistics Personal Protection Door Caddy by Devine Medical at Doctor Joe Says. MPN: 17677. Hurry! Limited time offer. Offer valid only while supplies last. Neatly store protective apparel supplies for easy access and retrieval. Quick and convenient caddy storage improves personal protection practices! Neatly store protective apparel supplies for easy access and retrieval. Quick and convenient caddy storage improves personal protection practices! Conveniently holds gloves, masks, gowns, medical waste bags, hand sanitizers and other miscellaneous items on the door. Clear pocket allows instructions, signs and warnings to be prominently displayed. Keeps hallways free from supply cart congestion and eliminates violations of fire, logistic and regulatory codes! Includes Metal Hanger Set. Neatly store protective apparel supplies for easy access and retrieval. Made of a flame retardant material that will meet California 117 standards.